This movie features Nigel Fennell A.W.C.F. and explains how Nigel shoes the front feet of an English working shire horse with hand made flat shoes. The movie explains the techniques that Nigel uses when working on these gentle giant. Running time: 23 mins. 33 secs. This movie features Nigel Fennell A.W.C.F. and explains how Nigel shoes the hind feet of an English working shire horse with hand made flat shoes, whilst compensating for the individual horses conformation. The movie explains the techniques that Nigel uses when working on these gentle giants. Running time: 24 mins. 10 secs. 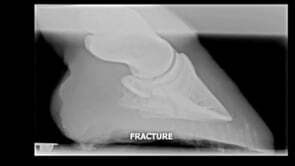 This movie shows how to identify the limb that the horse is lame on, how to carry out a foot search and locate the foot abscess. This movie forms part of element 2.2 of the National Occupational Standards in the U.K. Running time: 5 mins. 16 secs. This movie features a foreword by Haydn Price D.W.C.F, consultant farrier to the British Equestrian Federation, on the types of conditions that would benefit from having a Jim Blurton straight bar shoe applied. World champion farrier Jim Blurton A.W.C.F then demonstrates the correct fitting procedures for his straight bar shoe. Running time 4 mins. 20secs. This movie features a foreword by Haydn Price D.W.C.F, consultant farrier to the British Equestrian Federation, on the types of conditions that would benefit from having a Jim Blurton Egg Bar shoe applied. World champion farrier Jim Blurton A.W.C.F then demonstrates the correct fitting procedures for his straight bar shoe. Running time 4 mins. 22secs. This movie features a foreword by Haydn Price D.W.C.F, consultant farrier to the British Equestrian Federation, on the types of conditions that would benefit from having a Jim Blurton’s Heart Bar Shoe. 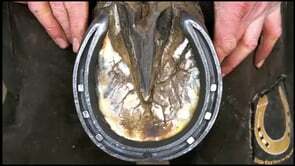 World champion farrier Jim Blurton A.W.C.F then demonstrates the correct fitting procedures for his Heart Bar Shoe. Running time 5 mins. 38 secs.